As you know Zacatecas is an old historical city. 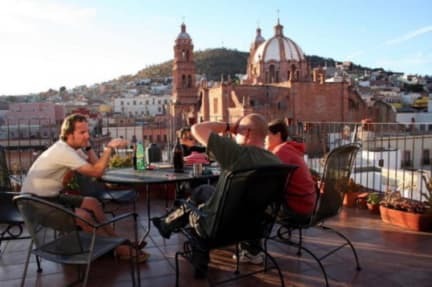 It was here in Zacatecas that the turning point of the Mexican Revolution came after its fall to the legendary Pancho Villa. One thing lacking though, was a decent hostel with all the added extras that you like to see. So I took the plunge, and have just opened the doors of Hostal Vila Colonial. Check- in 12.30 p.m - midnight, please note you need to contact the hostel directly if you are arriving after 7 p.m. This was a good hostel. The owner was helpful since im American and my English isnt good. There was a great view from my room. Its close to everything you need in Zachetas. Theres a kitchen, if you neeed to cook. Amazing views from the terrace, central location. I was stunned at how centrally located the hostel was. My view was of the back end of the cathedral, but a kid with a half-decent baseball arm could have hit it on the fly. It could not have been better situated to everything. The hostel itself is in a 200-year-old house. Large library in English, German and French. Great view from the terrace. It's very clean, the kitchen good and the staff is quite helpful, but to make the most of it, it's best to know Spanish, the English skills are minimal. The location is perfect and is right behind the cathedral in the center of town. The room we had was on the top floor which means you have to climb 6 sets of stairs. The view was great and I could see the cathedral all lit up at night while laying in bed. However there is no water pressure or hot water. Also in the morning there was nobody around to open the door so we couldn't leave for half an hour while we waited for the manager to come and open the door. That happened twice. recommend. Great location overall. You get what you pay for, basic stuff but walking distance from all major attractions. Basic hostel without a lot of interaction between guests. The building feels a little claustrophobic, but the rooftop patio has nice views but is mostly deserted. Good enough for sleeping during your stay in Zacatecas. The hostel was alright, relatively save, decent kitchen and beautiful rooftop terrace. It is quite an old building though and not very well maintained. The room I was in was missing glass in the window so it was freezing cold at night in November. It is a bit damp but not too bad for a couple of night if it would be warmer. Staff was very rude. Site says credit cards accepted but they refused while saying only cash allowed. We checked room and it was dismal, broken, and gross for a private ensuite. Location is great, but quality weak. The common area had no vibe, quiet and dead. Just one scary sort of security guy that gave us concern when we had issues paying cash the staff said "you need to pay now or you will have problems" very sketchy staff for our experience. We left as the hostel was empty besides them. Unfriendly staff. Windows were broken in and generally bad atmosphere.